Not only was this stone uniquely shaped, it also has eye-catching streaks (or needles) of black (tourmaline) through the clear quartz. Wrapping this shape is very easy, I love it! 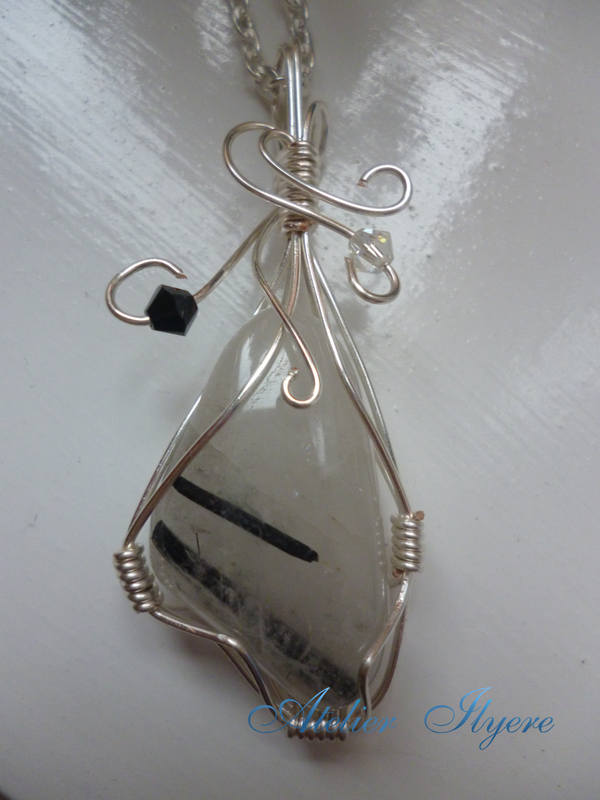 It’s not as fiddly to hold in place like round tumbled stones are, and the wire looks more natural since you don’t have to pull the wire out into triangle shapes to hold it into place. I also adorned the swirls with contrasting clear and black Swarovski crystals to make the colour scheme of the stone. This entry was posted in Gemstones, Jewellery, Pendants, Swarovski, Wire and tagged Black, Clear quartz, Gemstone, Jewellery, Necklace, Pendant, Silver, Swarovski, Tourmaline, Tourmaline quartz, White, Wire. Bookmark the permalink.